We were very eager to get to our hotel In Arles, after a long and tiring, 30-hour trip from Seattle to Provence, only to be greeted by this monstrosity outside our room window. But seriously, it was fascinating to learn that this First Century Roman Arena is only the 20th largest around. In the middle ages, the French turned it into a walled city – with watchtowers above and houses inside – but it has been restored and again hosts bullgames –the more civilized Provencal equivalent of the bullfight – and other sporting events. 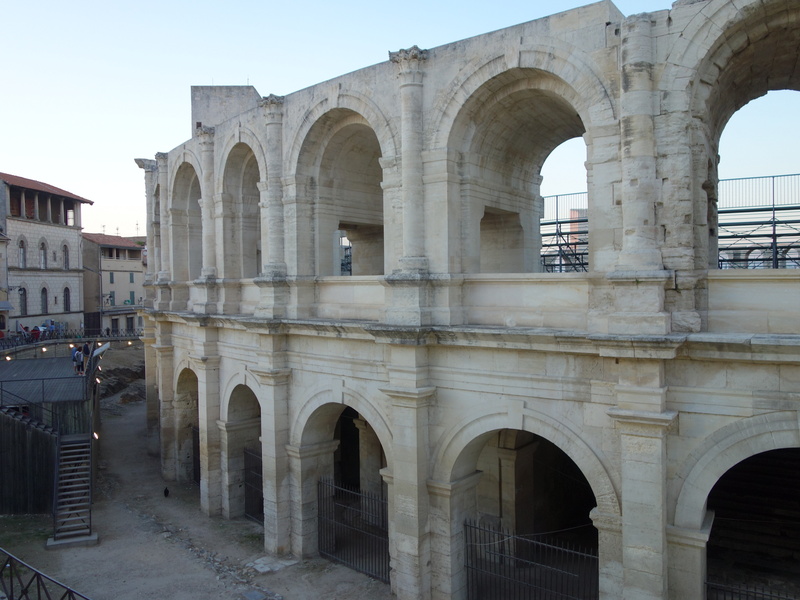 It is not unlike the rest of Arles, a medieval city built on a Roman foundation, now being preserved in this UNESCO world heritage city. Pat and I are here on the first day of a couple of weeks in Provence. 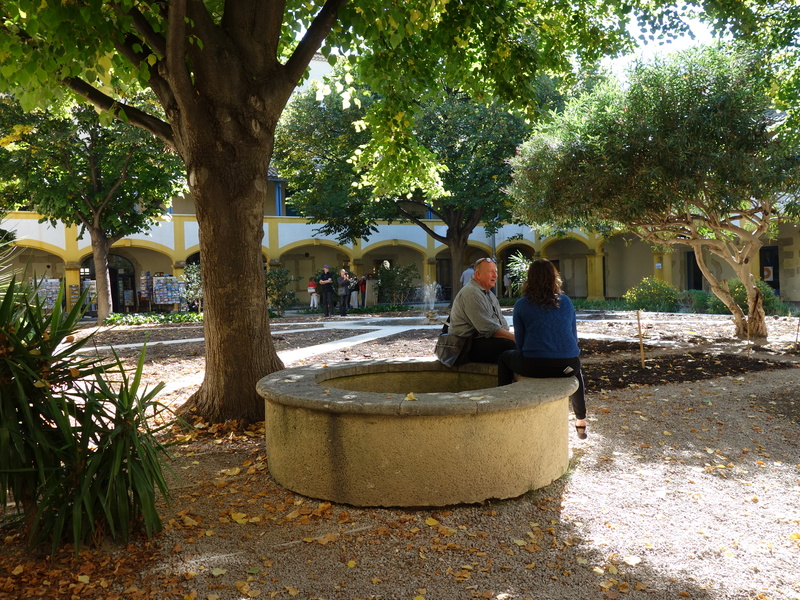 We are spending two nights here in Arles, then renting a car and driving to a house we have rented in the small town of L’Isle sur la Sorgue, on the Sorgue River near Avignon. Pat is eager to see a “bullgame,” which we have been assured is merely exercise for the bulls who are not injured and live to “game” again another day. However, there is a special dish of the Camargue called “bull stew” on virtually every menu, so I’ll bet that they do meet a dismal fate after their gaming days are over. Bull stew, incidentally, is delicious, and I suspect the bulls participating are not all that old. Arles is also quite well-known as a place where Van Gogh did much of his work. There is a modern museum dedicated to him, and the city maps have a number of Van Gogh sites. The plan now is to rent a car here take day trips around Provence. Watch this space for further details. 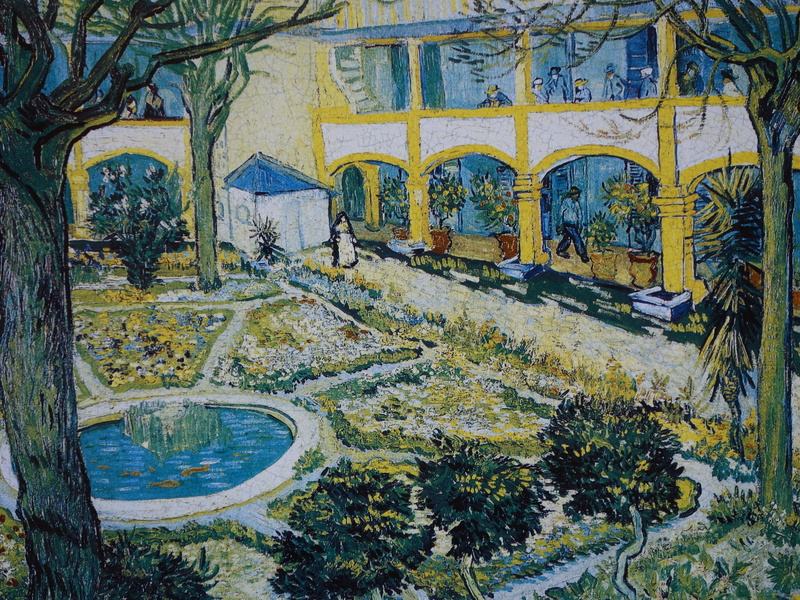 Van Gogh’s painting of the garden at the hospital where he was kept. My photo of the same scene. As recommended, we arrived at Sea-Tac two hours early and sped through security because of our TSA-precheck status – the closest we will get to living in a walled neighborhood like medieval Arles or 21st Century Broadmoor. As we settled into our Airbus A-330, for what we thought would be a nine-hour flight, we were told that the airplane was broken and we would need to deplane and wait in the gate area. Four hours, several beers and lunch later, we were allowed to board. As we settled in for the second time, we observed that travelers were tense when the guy in front of us began being verbally abusive to someone who tried to adjust the location of his overhead bag. We were delighted that Delta was able to fix a problem with the joystick and thus we arrived in Paris about 17 hours after leaving Edmonds. I don’t know about you, but I can’t sleep on airplanes. The preferred method of traveling to Europe from Seattle is to take one of the non-stops – London, Paris, Amsterdam or Frankfurt – and then a short hop within Europe to your destination. That has worked in the past but not this time. I might be tempted to build in a short stay in one of those cities in the future. We are getting too old for this. However, today, our first full day, was a great experience, and we recommend Arles highly. Pat has turned in early, and I have encouraged her not to wake me if she gets up to livestream tonight’s Hillary v. Trump debate, which will air at 3 a.m. Continental time. I know the fate of the free word hangs in the balance, but I am kinda tired. Enjoy! Tom and I spent two weeks in a wonderful farmhouse outside Bonnieux a few years ago. The trip of a lifetime. We loved it. Imagining you in Isle Sur La Sourge on market day. Such fun. Looking forward to your blog. Dave, I enjoyed reading of your latest mis-adventures.